The domestic ferret is seasonally polyoestrous, which means that they have multiple periods of maximum sexual reciprocity per season (Lindeberg, 2008). Contrary to what is seen in humans, female ferrets are constantly in heat from late March to early August. 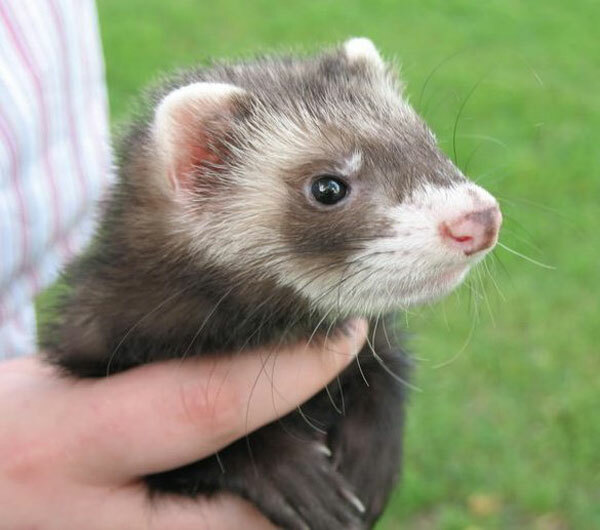 Reaching puberty at around eight to twelve months, and sexual maturity at six months, domestic ferrets usually have plenty of time to reproduce. They can be “in heat” for up to five months, but once ovulation occurs, either pregnancy or pseudopregnancy always follows (Lindeberg, 2008). Copulation itself usually lasts anywhere from fifteen minutes to three hours, while the average lies somewhere around one hour (Duda, 2003). Ovulation occurs when there is pressure exerted on the cervix connected to copulation. Approximately three to fifteen female oocytes are then released thirty to forty hours after copulation. These oocytes are most capable of being fertilized around twelve hours after ovulation, or forty-two to fifty-two hours after copulation. Embryos enter the ferret’s uterus over a period of several days, beginning five days after copulation. The total length of gestation in female ferrets is approximately thirty-nine to forty-two days, with an average net birth of eight kits, each weighing six to twelve grams at birth (Duda, 2003). The Common Genet, on the other hand, has a much longer gestation of around seventy to seventy seven days, resulting in the birth of only one to three young. Healthy domestic ferrets can birth up to three successful litters (or fifteen kits) per year. Male ferrets, unlike their female counterparts, go into heat from December to July. Their penises are hooked, meaning that once penetration of the female occurs, they cannot be separated until the male releases. Males exhibit a physical trait when they are ready to mate; they develop a discolored undercoat due to an increase in oil production. During this time, they will mate with as many female ferrets as they have access to. Newborn domestic ferrets generally need about eight weeks of parental care, due to their lack of sight or hearing when they first come out of their mother’s womb (Duda, 2003). It takes approximately five weeks for newborns to be able to see and hear. Weeks three to six are dedicated to weaning newborns, and eight weeks is usually when breeders let the kits go to new owners.